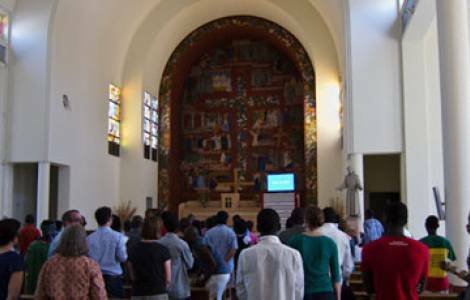 AFRICA/MOROCCO - The Archbishop of Rabat: "Let's get ready to welcome the Pope"
Rabat (Agenzia Fides) - The Pope’s visit Francis to Morocco on March 30 and 31 will be "a great event for our Church", says the Archbishop of Rabat, Mgr. Cristòbal Lòpez. As reported in a note by the Archdiocese of Rabat sent to Fides and spread in the diocese, "they will be two very demanding days, full of meaningful meetings", starting with the migrants of the diocesan Caritas of the capital and the social center run by the Daughters of Charity, on the outskirts of the city. A visit to the Mohamed VI Institute for the formation of the Imams and preachers is also scheduled, as well as the meeting with His Majesty the King and the Moroccan people on the esplanade of the Hassan Mosque. "All Christians who want to meet the Pope during the Mass can do so - continues Mgr. Lòpez – you will need to have patience and pass the necessary security measures, but it will be important to be there. The Eucharist, the culmination and source of all Christian life, will also be the culmination of Pope Francis' visit and the source of all that will result from his presence among us". Mgr. Lopez points out: "The Pope will come to Morocco as father of all Catholic Christians, a person of good will who wants to meet everyone. And for everyone, he presents himself as 'Servant of Hope'. He comes to fill us with hope, to give us strength, to recover from discouragement, to instill enthusiasm; he comes to announce the Gospel to us".